I’ve been listening to audio books in my car a lot lately. I’ve been able to enjoy several lately (much better than talk radio since you learn something). 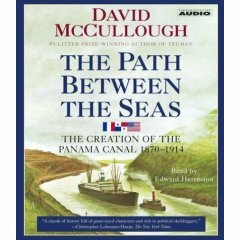 I just finished David McCullough’s book called The Path Between the Seas: The Creation of the Panama Canal, 1870-1914. Now the first thing to notice is the 44 year timespan it took to create the canal (really a long canal with locks and a lake in the middle). That timespan includes a lot of failures that built up to success in the end. Failure by both the French (yes, the French were involved which I didn’t know) and the Americans. Approximately 12,000 ships pass through the canal each year. Nicaragua was almost chosen as an alternate route. At the height of construction, there were 40,000 workers working on it. Yellow Fever was a big problem during the construction and Malaria as well. Yellow Fever was literally eradicated when the Americans removed all standing water. For much of the construction period the plan was to build a canal at sea level. Which would have meant building a much deeper canal. Even up until the Americans started construction this was the original plan and Congress even got in on the decision. A railway was built and served to transport supplies and excess material back and forth across the canal line. Most of the electric motors and generators were built by our very own General Electric and most of the steel materials for the locks were made in the USA. The day the canal opened in 1914 was the same day World War I erupted and the event was hardly reported. Apparently, the amount of cement was so vast that the workers were instructed to “shake the bag” when it was empty at a reported savings of over $50,000 (and in 1914 that was a lot of dough). Overall it was a fantastic book. I previously had only a cursory knowledge of the Panama Canal yet never knew the history or the great struggle to build it. Fascinating book and I would recommend it. I’ve also had the privilege of listening to some other books by this author and hope to write up a review soon. He’s a very good author and gives you details that add to the story. Here’s a link to Amazon with more info. You might also find the article on the Wikipedia to be of interest. Why four gophers intead of five? Well, in my opinion the book spent too much time focusing on what happened with the French (first half of the book) rather than the Americans (the last half of the book). The American part could have been longer and added more details. But that’s just my opinion. Overall it was an excellent read!! You’re just lucky I didn’t use the animated one. 1870-1914. Erm. Wouldn’t that be 44 years? That would be thirty years from 1870 to 1900, and then an extra fourteen years from 1900 to 1914. Correct me if I’m wrong, but 30 + 14 = 44. Right? No that would be 444 years, as in, 444 years on the moon Europa. Hahahahahaha. I agree. I read this recently and wanted MORE focus than what the book offered on the “American” side of things in the creation of the Panama Canal. But as for the facts and timeline, it stood good ground. Surely one of THE incredible engineering feats of modern times. I like reading other people’s reviews of books that I have also read, even though I often don’t agree. I’ll have to check this out…sounds very interesting. I particuarly enjoyed David McCullough’s epic biography of John Adams. Great Stuff! Oh i have this book long time ago? Wow im getting older and older haha and that Gophers geez.. love your site bro..